A brilliant physician, specialised in combat medicine, general surgery and virology. She posesses vast medical knowledge that supplant her specialization knowledge, and she isn't afraid to let it show. On the other hand, the Hipocratic Oath, the Nightingale Pledge and the rest are often ignored or thrown aside when it comes to Maliya, as she calls herself the healer of the body, the counselors she considers the healers of the mind. She's got a sarcastic sense of humor and approach to life, and will mince no words when she has an opinion, and considers herself the higher authority when it comes to things medical, so orders from superior officers will often go disobeyed. Born into the dreaded Occupation, as the younger sister to Reyla, and daughter to Lyrra and Antosso. The whole Torrna family was a long line of healers, and as such young Maliya began training as one also. It was unfortunate that at a very young age, all four of them joined the Ornathia resistance cell, and worked dilligently with them. But dedication has its drawbacks, and in a raid Maliya was left an orphan. For a while she forsook her healing and took up arms and combat and trained with the cell furiously, becoming an efficient, and often ruthless soldier. As the years drew, and the Cardassian-Bajoran armistice was signed, and the Federation came, Torrna had grown up, and decided she needed a break from the cruelty and death, and saw the Federation as a chance of a new life. So, along with her newfound cousin, Valeris, she applied for Federation sponsorship and was soon accepted into the programme. Maliya didn’t have an easy time at the Academy. She was regularly tossed out of classes which involved racial tolerance, especially towards Cardassians. On the other hand she excelled in the Medical Fields and the fields that involved combat, given her prior experience in the Resistance. Unknown to her at the time, she was at the Academy at the same time as Jack Lashmore, whom she would meet years later on the USS Roanoke. But her past had forever scarred her, and the change was furthered by the atrocities expirienced and witnessed during the Dominion war, into which she was thrust right out of the Academy, on the Medical Ship, the Warsaw. She spent 12 years on the Warsaw, seeing through the Dominion War, all the way up to 2383 when she was decomissioned. The one friend that has stayed in contact with her during that time is a joined Trill woman called Annaria Lhinn, who had been a fellow medic on the Warsaw for several years. And that was when all hell broke loose, again. The Roanoke was soon declared a rogue vessel after she was accused of a bombing of the government building on Trill. Although innocent of the heinous act, due to a lot of bad decisions from Captain Zara Tane, the Roanoke chose to run instead of defending themselves. During the rogue period as they were trying to prove their innocence, each and every officer who served on the ship gained that ill reputation that comes along with having been on a vessel gone rogue. In the end they DID manage to clear their name and were a part of Starfleet again. 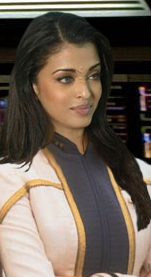 Unfortunately, in the meantime Maliya had managed to step on Tane’s toes and the latter, being of a very volitile nature demoted her from Lieutenant Commander to Lieutenant, along with a very bad reputation mark via Tane’s connections. At this point Torrna asked for a transfer off the ship. In the end they DID manage to clear their name and were a part of Starfleet again. Evidently what happens on Rome did not quite stay in Rome, if the Captain’s husband, whom she shared a one night’s dalliance with was asked. Maliya had managed to step on Tane’s toes with that act and the latter, being of a very volitile nature demoted her from Lieutenant Commander to Lieutenant, along with a very bad reputation mark via Tane’s connections. At this point Torrna asked for a transfer off the ship. After a time of being in limbo and on various layovers, she wad finally assigned to Starfleet Medical as a research physician with the Special Diagnosis Unit, a position she considered punishment more than anything else. She would only later admit just how much she learned from the infamous Doctor Gordon Hill. Infamous in being brilliant albeit rather insane. Still it was the only place that would actually have her and put her skills to use rather than let her stew and wait. So it came to be that she spent three years there, not making attachments and only passing acquaintances, which in turn suited the bajoran just fine. She had had it with people and attachments. The Prophets, however, seemed to have a different idea, when in 2389 they came a knockin’ as the USS Southern Cross, needed a Chief Medical Officer.